At age 40 one begins to see certain functions within the brain begin to slow. It is a natural process. Crossroads Institute can screen for short term memory loss and dementia. Conducting a complete NeuroGeniSys Procedure will show whether memory loss is actually a physiological problem or if these issues might be medication driven or health related. Some medications when taken over a period of time or in combination with other drugs will look like Alzheimer's or dementia. If the NeuroCognitive assessment and brain map indicate memory loss and other related bio-markers, Crossroads may also recommend investigating diet/nutrition, toxins within the body system and environmental concerns. Sometimes detoxifying the system will be indicated. Often we find issues can clear by detoxifying the system and healing body systems. Other times, medications are indicated as the cause. Regardless of the underlying root cause, it is important to pin-point what areas of the brain are adversely affected and why. It is the only way we know to truly target the proper areas of the brain with the appropriate therapies and activities. 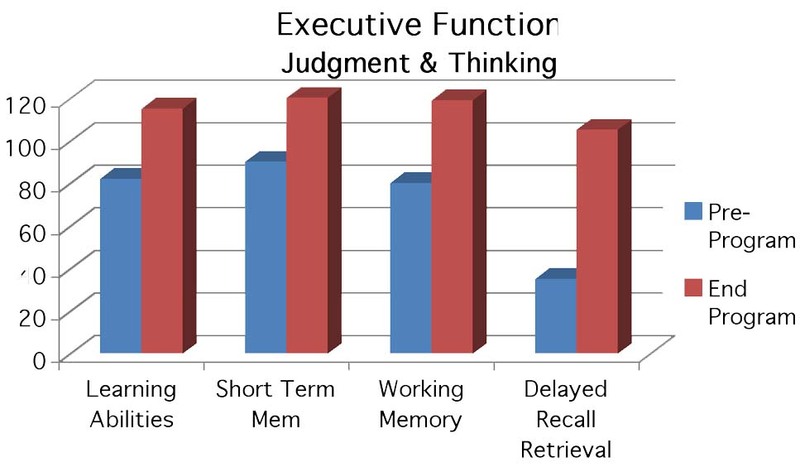 If we find a memory loss issue based on the neurocognitive evaluation, Crossroads Institute offers an appropriate program that targets and strengthens the processing power of the brain. It may be recommended that individuals take part in our Adult Brain WorkOut setting as well as other short term memory programs. We attempt to increase neurological peak frequency to improve mental performance. It has been demonstrated repeatedly by doing the neurodevelopmental exercises coupled with NeuroGeniSys this condition can be improved.